Debuting on Denver’s expanding cultural red carpet and filling a long-missing link in the city’s urban fabric, Toronto-based First Gulf’s new office development 1401 Lawrence is poised to usher in the next generation of skyline-defining towers. Anchoring the corner of Lawrence Street and 14th Street – recently dubbed Denver’s “Ambassador Street” for its lively complex of visitor activities – and adjacent to historic Larimer Square, the development’s owners and architects skillfully finessed the design to acknowledge the city’s history. The office tower will be both emblematic of a different age with its dazzling glass skin and, through strategic shifts of scale and detail, a comfortable complement to its neighbors. In 2014, First Gulf commissioned The Beck Group, an award-winning architecture and construction firm with an integrated delivery model, to design and build the $70 million, Class AA, 22-story structure. With global commercial real estate advisory firm Newmark Grubb Knight Frank involved early in the design process, the development was well-aligned with Denver’s evolving office needs and focused on delivering a building where top-tier office tenants could create workplaces that attract the best and the brightest employees. 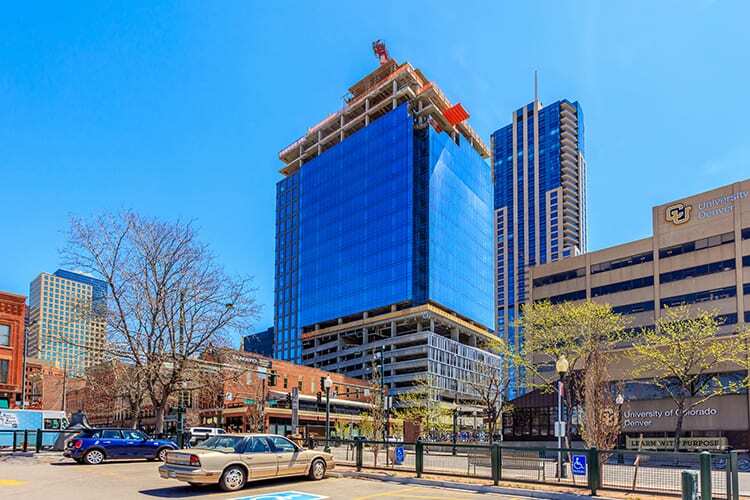 Construction of 1401 Lawrence began immediately after national law firm Polsinelli PC committed to leasing space in the building, and the team hasn’t looked back since. “First Gulf’s directive was to design a highly efficient and sustainable building that also made a statement,” explains Beck’s design principal and project lead designer David Morris. Morris’s team skillfully generated a zero-lot-line plan with ground-floor retail to activate the street level, seven floors of above-grade parking (enclosing 400 parking spaces), and 14 floors of highly efficient 22,000-square-foot office floor plates. With these key elements in place, Morris admits the challenge for his team became, “How do you take something so constrained and with maximum efficiencies in plan and craft a tower that is dynamic in massing and form?” But after a visit to First Gulf’s built projects in Toronto and making several additional trips to study significant high-rise curtain-wall structures throughout North America, “It was clear First Gulf was interested in elevating the game in Denver,” Morris says. After numerous design iterations, the Beck team arrived at an elegant glass “jewel box” design that utilizes a metal-fabric-wrapped concrete podium to raise the curtain-wall-clad office tower nine stories above the ground plane – just as one might be lifted onto somebody’s shoulders for a better view. As it turns out, that better view is spectacular, with the expansive cityscape and Front Range visible from each office floor. “We studied countless glass samples and curtain-wall manufacturing and installation techniques to ensure the transitions from the clear class façade to the spandrel infill panels at the floor levels would be nearly imperceptible within the overall structures clear glass facade,” says Morris. 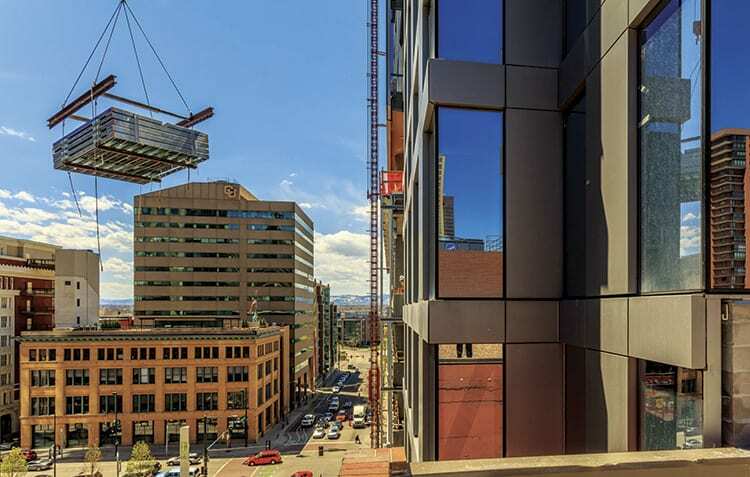 The design team also incorporated “punched” openings wrapping around the building corners, creating a design feature that clearly references Denver’s masonry building tradition. On the interior, the 12-foot floor-to-ceiling glass system and clear structural span from the building core to perimeter columns allows natural light to penetrate deep into the building’s interior, while shades linked to the building automation system will keep the heat load down on the brightest days. Even with its expansive glass surfaces, the building – targeting both LEED Gold Core & Shell certification and Energy Star qualifications – will achieve a high level of environmental efficiency. 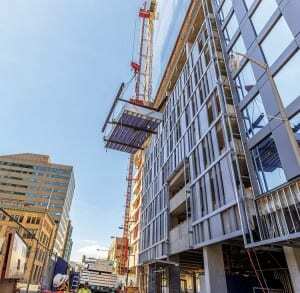 According to Norma Lehman, Beck’s director of sustainability, the energy costs at 1401 Lawrence are expected to be 22 percent less than a baseline building of similar size, use and location. “We model all our projects to meet our firm’s AIA 2030 commitment targeting energy reduction goals and striving to make all our designs carbon neutral by 2030,” Lehman says. Factors contributing to the savings and to the projected LEED Gold rating include high-performance glazing, high-efficiency equipment, reduced interior lighting loads and 40 percent reduction in plumbing fixture water use from the baseline. “A reflective roof and light-colored hardscape keep heat away and reduce the urban heat island effect,” Lehman adds. Bike storage, electric car charging stations, diversion of waste from the job site and a walkable project location provide additional strategies for sustainability and occupant well-being. 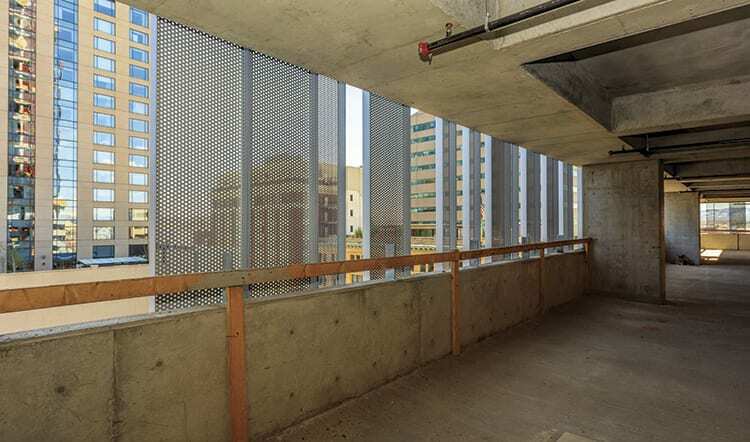 At the parking levels, the structure is cloaked in an alternating rhythm of perforated aluminum panels, providing an intriguing and elegant appearance that blends easily with its surroundings. The panels not only provide visual screening from the parked cars, but also allow for natural ventilation. Two, two-story art walls (one facing 14th and the other facing Lawrence Street) designed by Beck and produced by internationally acclaimed architectural metal fabricator Zahner, will be integrated in the garage screening. These perforated zinc panels depicting an abstract interpretation of the Rocky Mountains will also be backlit, further enhancing the streetscape at night. Both First Gulf and The Beck Group worked with Denver Arts and Venues to approve the outdoor art concept’s design that, along with pedestrian active uses at the ground level and transferable development rights, afforded the developer floor area premiums. From the sidewalk, pedestrians will experience inviting retail shops and restaurants with outdoor patio seating and landscaping consistent with the “Ambassador Street” vision for 14th Street. “This is the first new office tower to be built in the ‘premium zone’ along 14th Street,” explains Studio InSite Principal Dennis Rubba, who led the project’s landscape design and the street’s redesign efforts. Comprised of a 12-block corridor that runs through the theater/convention center district and links the Lower Downtown and Civic Center districts, the area offers the most diverse uses of any 12 blocks in the nation, according to Rubba. 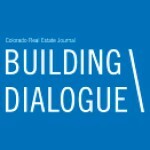 “You have everything from a historic district to the University of Colorado Denver, condos, restaurants, shopping and cultural and civic uses in between. The streetscape is intended to tie all these different uses together and animate the public realm,” he says.